There are several things you can do to lessen long-term pain and make it easier to live with. Activity such as yoga, swimming, cycling, and strengthening exercises can improve arthritis and joint pain. They can also help you to move more freely and do more. Talk to your GP about a Green Prescription, which will help you get more activity into your day-to-day life. You could see a physiotherapist for some strengthening exercises. 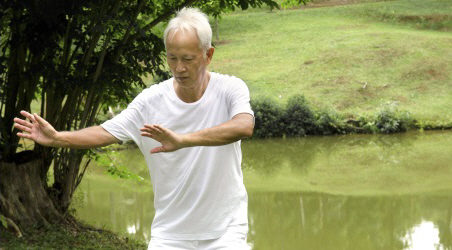 Arthritis New Zealand and Physiotherapy New Zealand have produced a guide called Arthritis – Exercises to keep you moving. Wear shock-absorbing footwear, such as cushioned trainers, for work and walking. A podiatrist might be able to fit insoles called orthotics to your shoes. These can relieve pressure to the painful joint if you have arthritis in your legs. In general, avoid getting cold and stiff, as this can make your joints hurt more. Make sure you keep your joints warm in winter – using woollen wraps and underlays can help. If you get generally cold and stiff, a hot shower, bath, or spa might help. When just one or two joints are painful and stiff, some people find that applying heat packs can help. If the joint is swollen and inflamed, applying ice may be more helpful. Generally it's best not to use braces and strapping long term, as you may end up losing muscle strength and physical ability. However, it might help to prevent stiffness and pain if you support a painful joint in a comfortable position on a pillow when you are sitting, or sleeping at night. Arthritis New Zealand has a summary of supplements and therapies that may help some people with some sorts of arthritis. If you are taking other medicine, always talk to your doctor or pharmacist before starting any supplement or complementary medicine. Paracetamol provides safe and effective pain relief for joint pain, as long as you take it at the correct dose. Because it is so common, many people underestimate how effective it can be. If you have early joint disease it may help to take paracetamol before you do anything that you know makes it worse. If you have more severe disease, you may need to take it more regularly through the day. If you are taking paracetamol regularly you should see your GP so they can check this is safe for you and you are taking the correct dose. This can be useful, particularly for easy-to-access joints, such as your hands and knees. Smooth the cream onto your skin, but you don't need to rub it in. Creams are safer than taking non-steroidal pills, but you sill absorb a small amount into your bloodstream, so don't use more than the recommended dose. You can't get prescriptions for non-steroidal anti-inflammatory creams, but you can buy them over-the-counter at your pharmacy. Always follow the directions for use, and stop using the cream if it irritates your skin, or you develop a rash or skin irritation. This cream works by acting on the nerves that carry pain messages to the brain. Don't use it on broken skin. It is useful on hands and knees, but is not recommended for other joints. Capsaicin cream takes around a week to start working and it can be up to six weeks before you get the full effect. When you start using it you may get a slight burning sensation, but this goes away as you build up the doses and use it more regularly. It works best and causes the least irritation if you use it three to four times day. You may be able to get it on prescription if you have already tried paracetamol and non-steroidal anti-inflammatory tablets aren't suitable. Ibuprofen, naproxen, and diclofenac are all non-steroidal anti-inflammatory medicines. Although they are often very effective for joint pain, they do have significant risks. If you are taking one of these medicines more than occasionally, you should tell your GP. They can assess you to see if you are safe to continue using it, and monitor you for any problems or side effects. You should not take NSAIDs if you have problems with your stomach, kidneys or heart disease. If your joint disease is more severe or if you cannot take NSAIDs, your doctor may suggest using codeine with paracetamol. Codeine is a strong pain medicine that can cause drowsiness, nausea and constipation, but it is generally not a problem in low doses. It works best when you take it with paracetamol, and it can be useful for pain at night. Codeine can be quite addictive, so don't take more than you have been prescribed or need. Your GP may suggest trying medicines such as amitriptyline or gabapentin. These affect the way your brain processes pain messages, and can be quite useful for night pain. They tend to work better for shoulder and back pain. Your GP will be able to talk to you about how these medications work and any possible side effects. You can also read more about them on the page Medication and treatment for chronic pain. Take any pain medicine, whether prescribed or over-the-counter, at the dose it says on the packet. Never increase the dose because you think it will work better. It won't, and it could lead to dangerous side effects. Written by HealthInfo clinical advisers. Endorsed by occupational therapy liaison, Canterbury DHB. Page created January 2016.